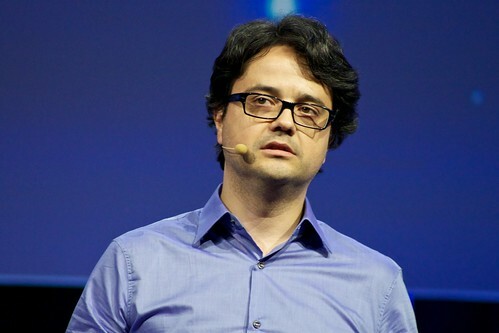 You should never tell a secret to Loic, as he asks you to come to LeWeb and share with anywhere. The secret is the digital revolution in Latin America. There is a lot of activity there, 1000s of entrepreneurs, plus lots of people using the web, how they interact is changing the rules. The economy, in the last 50 years, there has been loads of crises in LA..they know there is light at the end of the tunnel. They have built a different kind of economy. Terra tend to offer lots of content for free. The revenue is in advertising. Sonara, is a music service, with 6million users. They treat as a platform, So they have the service, they do live shows, they do festivals. Live shows at least once a week. They had 1.5m people watch Paul McCartney. They offer Terra TV, so people can watch TV for free. It also has a premium offering., they get to see more for money, first for free. They have a portal, with 100m visitors. Again premium offerings in this. They show the Olympic games, with lots of extra information. For London, will offer more channels, HD, more stats etc. This entry was posted in conference, leweb and tagged #leweb, leweb11 by Rachel. Bookmark the permalink.